A counterfeit team has been busy intercepting knock off products like jewelry, hand bags and candles before they get to UK homes. 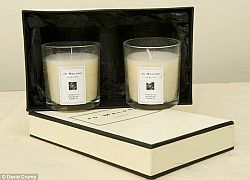 Unfortunately, Jo Malone’s famous scented candles are also being copied. The packaging looks the same, but the glass containers could explode. It might be tempting to go for money saving knock offs, but in this case it’s downright dangerous!